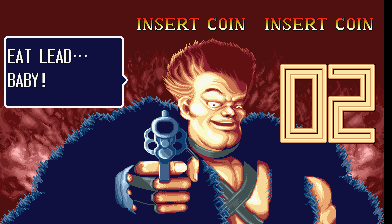 This game is a scrolling beat 'em up. The objective is simple: enemies will come onto the screen and you need to defeat them. 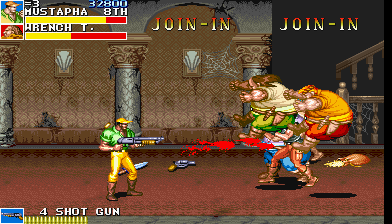 Clearing one wave of enemies lets you move on through a level where you'll encounter more thugs. At the end of each level there is a boss who must be beaten to move on. Use every move at your disposal (see the characters page for how to do them) and every weapon you can find to win. You can tell how much health an enemy has as when you start attacking them their life bar appears beneath yours. If you see an object you want to pick up -just move up to it and press the attack button. Your character will automatically pick it up. Press the attack button again to throw the object. 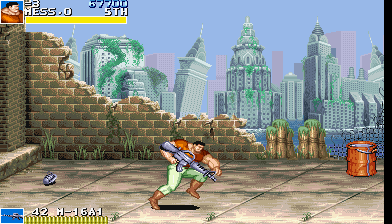 Throughout the game there are many different weapons you can use, from baseballs bats to assault rifles. You can either get weapons by smashing open crates and other objects, or by defeating an enemy who has a weapon. To pick up a weapon just stand over it and press the attack button. There are lots of different weapons in the game -check this page to see them all. You will drop a weapon if you are knocked down by an enemy or use a special attack. Double tap any direction and hold it on the second tap for this. Your character will dash instead of walk for a few seconds. As long as your life isn't at zero, you can use a special attack. 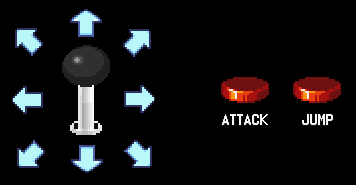 Press the attack and jump buttons together. Your character will do a move that will knock down any enemies near to them -perfect if you are surrounded! But remember, whenever you use one of these you will lose a little life. 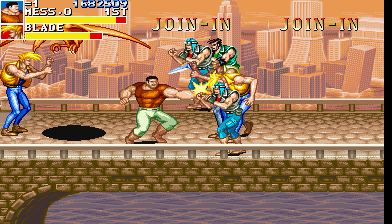 In multi-player games, there are a couple of techniques you can do by having both characters hover over each other for about a second. 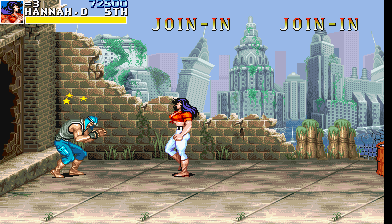 These moves generally give one character a great mobility boost, such as Mustapha throwing his friend up into the air, meaning they can do a really high jump kick. 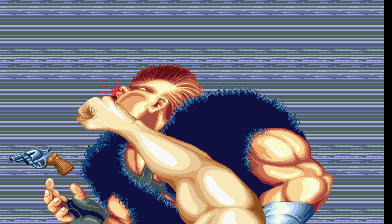 By hitting an enemy a few times in quick succession, you can stun them and leave them seeing stars. This just means you can basically get a free hit, or several hits, on them. Be wary though, as you can also be stunned if the bad guys manage to hit your character a few times. Watch out for the dinosaurs! 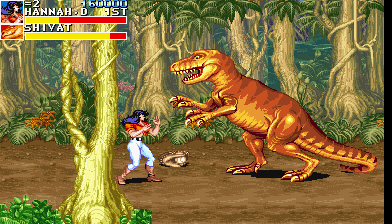 At several points in the game you will come across dinosaurs. If these creatures are colored orange, they will usually try to attack you. You can fight them and when they are defeated, they will turn green, cease their attack, and then run off the screen. 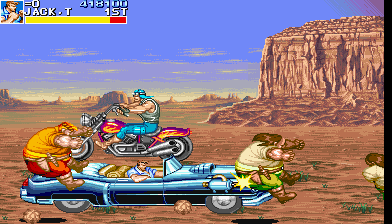 In the third level, you can drive the Cadillac and use it to get through the entire level fairly quickly, running down all of the enemies you find along the way. Use the joystick to move the car around, strangely any player can control the car -so if player 1 holds up, the car will go up, but if player 2 then holds down, the car will move down. Each credit will get you two lives on the default settings. You can earn extra lives by getting a certain amount of points, but the requirements for this mean you won't be earning many in a playthrough of the game. 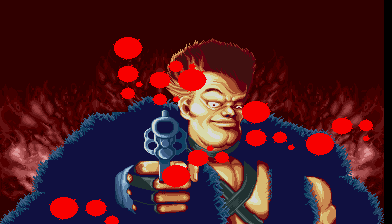 Once you run out of lives you'll be taken to the continue screen, where Vice wants to shoot you. If you don't continue, you get shot and the game ends. If you do continue, you get awesome and the game will continue where you left off. 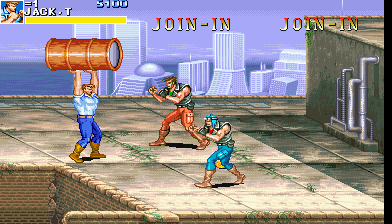 By using a continue, you can change characters before resuming play and whoever you choose will be equipped with a four shot rocket launcher.